Palazzo Del Sol имеет превосходное расположение прямо на воде с красивым видом на центр города Майами, залив Бискейн и Майами-Бич. Резиденты жилого комплекса Palazzo del Sol имеют доступ как к частной пристани для яхт, так и к глубоководной, принимающей яхты большего размера. Рядом расположен торговый центр — Town Center, который предлагает разнообразные рестораны и шоппинг. Парк Vanderbilt имеет игровую площадку, спортивную площадку и корты для баскетбола и волейбола. Оздоровительный центр Palazzo del Sol включает в себя 24000 квадратных футов. Здесь вы вы можете насладится СПА процедурами, а также позаниматься спортом в фитнес центре. , Резидентам Palazzo del Sol предоставляются частные тренировки и водная терапия. Также, на территории имеется парикмахерская и косметический салон. На сегодняшний день доступны к покупке 8 резиденций и 1 пентхаус. Одна 7-ми комнатная квартира, три -5-ти комнатных, две 4-х комнатных и две 3-х комнатных квартиры. TROPHY PENTHOUSE WITH ROOFTOP POOL + DECK BY ENZO ENEA!! Open floorplan w/ 6,644SF + 5,171SF 2-level Terraces. Rooftop entertaining incl Zero-edge Pool, Pergola + Summer Kitchen. West Exposure w/panoramic views of Star Island, Biscayne Bay, SoFi + Ocean. Guest suites enjoy Sunset + Golf Course Views. Private Elevator into expansive living areas w/18′ ceilings. Boffi Kitchen+Baths, Statuaria Marble w/Dornbracht + Duravit fixtures. Architect-Kobi Karp; Interiors-Antrobus+Ramirez; Landscape-Enzo Enea. DESIRABLE LANAI WEST UNIT EASILY ACCESSIBLE ON GROUND FLOOR FOR COMFORT OF GRAND ESTATE LIVING AND CONVENIENCE OF CONDO W/IMPECCABLE SERVICE. 5 Bedroom/5.5 Bathroom Residence w/8,680 sf Interior Living space + 12,844 sf Outdoor Terrace w/Vein Cut Marble. Private Zero-Edge Pool by Bradford included. Private air-conditioned Garage and Storage. 11.5′ ceilings, Boffi Kitchens + Master Baths, Lualdi doors, Gaggenau, SubZero, Dornbracht & Duravit appliances+fixtures. Multi-Lingual Concierge sees to Every Need. 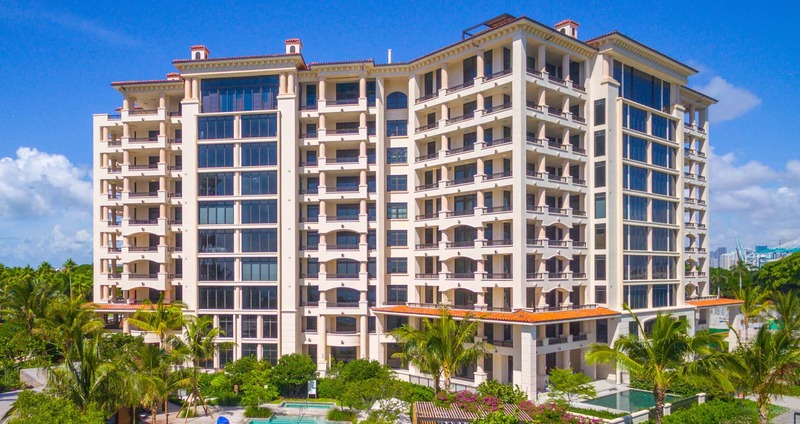 This amazing designer-ready residence at the newly-built Palazzo Del Sol is luxury at its finest. The expansive 9,514 SF home features rows of floor to ceiling windows providing the most stunning views. Large wrapping terrace with amazing unobstructed views to Government Cut, Atlantic Ocean, Miami Beach and Miami skyline. Open spacious living, dining & family areas, gourmet kitchen w/top Miele appliances, granite center island, granite counter tops/backsplash, Sub-Zero ref/freezer & custom Boffi cabinetry. Large master suite with his/hers walk-in closets & direct views to Govt. Cut & Miami Beach. Beautiful master bath features oak wood floors his/her sinks, Carrara marble walls, marble/glass rain shower, freestanding oval tub. Enjoy Palazzo Del Sol’s 5-Star amenities. Turnkey unit with high-end European furnishing, and finishes. Masterful design and modern luxury are uniquely embodied in this 5 bedroom, 6.5 baths, with over 7,600 SF spacious condo with a 2,800 SF wrap around balcony and floor to ceiling windows. Highlights include Lutron light and shade systems, Italian closets, light wood flooring, Boffi kitchen, custom made wine cellar, artwork display lighting, hidden mechanicals, Nest climate-control system, security system, and spacious corner rooms overlooking the Government cut for gorgeous sunrise. No expense was spared. LUXURIOUS GROUND FLOOR EAST LANAI WITH PRIVATE NEGATIVE-EDGE POOL IN ORGANIC COASTAL BEACH HOUSE DESIGN BY ARTEFACTO. 4 Bedroom/4.5 Bathroom Residence w/4,698 sf Interior Living space + 5,343 sf spacious Outdoor Terrace w/Vein Cut Marble. Perfect for Indoor/Outdoor living 365 days/year. Gorgeous for entertaining waterfront overlooking South Beach and Government Cut. Private Zero-Edge Pool by Bradford included. Totally Turnkey and furnished by leading Brazilian firm. 11.5′ ceilings, Boffi Kitchens + Master Baths, Lualdi doors, Gaggenau, SubZero, Dornbracht & Duravit appliances+fixtures. Convenient location on the ground floor across from lobby level amenities. Multi-Lingual Concierge sees to Every Need. Adjacent studio apartment available. MOVE-IN READY 4 BEDROOM BESPOKE RESIDENCE AT BRAND NEW PALAZZO DEL SOL, FISHER ISLAND!! NW Exposure w/Outstanding Views of South Beach, Government Cut & Tropical Fisher Island.Spacious 4,956 interior sf w/4 Beds&4.5 Baths. Listone Giordano Oak Flooring, Statuaria-Bookmatched Marble in Boffi Master Bath w/Piero Lissoni Tub, Dornbracht&Duravit Fixtures + Starphire Glass.Stylish Boffi Kitchen w/Gaggenau apps & SubZero refrigeration incl wine cooler. Ludaldi Itanlian doors & Apure Lighting by Porshe Design. AMAZING OCEAN VIEWS FROM BRAND NEW FISHER ISLAND HOME. Spacious 3 Bed/3.5 Bath B East floorplan features private elevator entry, 10′ floor to ceiling glass, Boffi Kitchens w/ Gaggenau & SubZero appliances, Boffi Baths w/Book-Matched Statuaria Marble & Piero Lissoni tub. Lualdi doors. Apure Lighting by Porsche Design. Boutique tower features unmatched amenities, Enzo Enea gardens, spa, theater, kids room, gym, salon, appertivo bar & 6-star white glove concierge services. Available for Immediate Occupancy! Получить консультацию или назначить время для просмотра объекта, вы можете оставив заявку с указанием объекта, своим номером телефона и Email.